Dana Inc. said it became the largest investor in Class 8 electrification company Hyliion Inc., expanding its ability to offer complete diesel-electric hybrid systems — which both companies view as disruptive to longhaul trucking and traditional powertrains. Dana did not disclose the amount of the equity investment. Hyliion develops intelligent, electric-hybrid architectures for Class 8 vehicles that can be installed on new trucks or retrofitted on existing trucks, essentially turning a traditional 6x2 truck into a 6x4 hybrid. Mark Wallace, president of Dana’s commercial vehicle driveline technologies, will become a member of Hyliion’s board of directors. As part of the strategic partnership, Dana becomes Hyliion’s source for traditional driveline components, as well as fully integrated e-Axles, which include motors, inverters, controls, gearboxes and thermal-management technologies. • traditional Spicer axles and driveshafts. Dana’s e-propulsion offerings now fit Classes 4-8, “and are more of a systems approach” for fleets as they move away from traditional drivetrains,” said Farney. The Hyliion 6X4HE features the company’s proprietary machine-learning algorithms and battery technology to optimize fuel savings and vehicle performance for reduced emissions and a better driver experience. “Where Hyliion’s core competency really comes into play is on the battery, software and system integration side, which are areas Dana does not presently have in their wheelhouse. So with this collaboration, we are really creating a full-circle approach where everything is being supplied by the two companies to build the hybrid or electric powertrain,” said Hyliion CEO Thomas Healy, who founded the company in 2015. “Fleets are very realistic when we talk with them. It is going to take a long time for the fueling infrastructure to change. A hybrid solution is something that can be implemented today, right now,” Healy said. 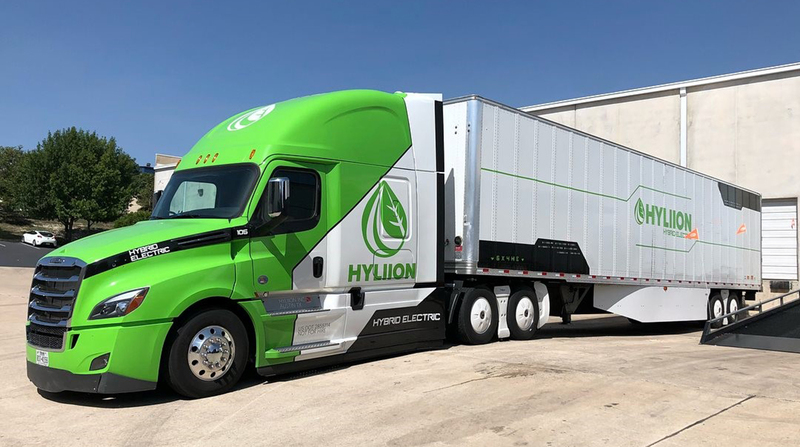 Requiring no driver training, Hyliion products reduce fuel consumption, reduce emissions and provide a positive return to fleets and the environment immediately, according to the Austin, Texas-based company. There are two fuel-savings opportunities. The first is the hybrid power assist, offering about a 10% to 15% gain. The second is the system can be used as an auxiliary power unit to manage hotel loads without running the engine, which is an additional fuel savings. “A few months ago is when we moved into revenue. We are shipping out products to fleets. From now through the middle of the year we are going to ship about 40 systems. Then we have plans with Dana to be able to increase our production in the second half of this year,” Healy said. Meanwhile, batteries used for electric commercial vehicles have become easier to manage, more powerful and less expensive to buy. “They have drastically improved over the past decade,” Healy said.